There is a game on my PC I can’t avoid playing. It’s one of those things I know I shouldn’t keep wasting time on, but I do anyway. I’ll never beat it, and playing it usually leaves me frustrated rather than content. I asked myself why I keep playing Wolfire’s Receiver, and this is what I discovered. Imagine waking in an endless building complex filled to the brim with deadly robots. Sure, you have a gun, but do you know how to use it? Do you have ammunition? Is the safety still on? Normally a gun in a video game is simple; you press one button to reload, and another to make things in front of you stop living. I’ve played many first-person shooters where players can sprint while reloading a light machine gun, then score multiple head shots after leaping off of a cliff. Receiver does a very good job of showing how ridiculous that would be in real life. The game was created as part of a 7-day challenge, and has a lot of rough edges compared to other shooters. Because of this I’m hesitant to even call it a game. 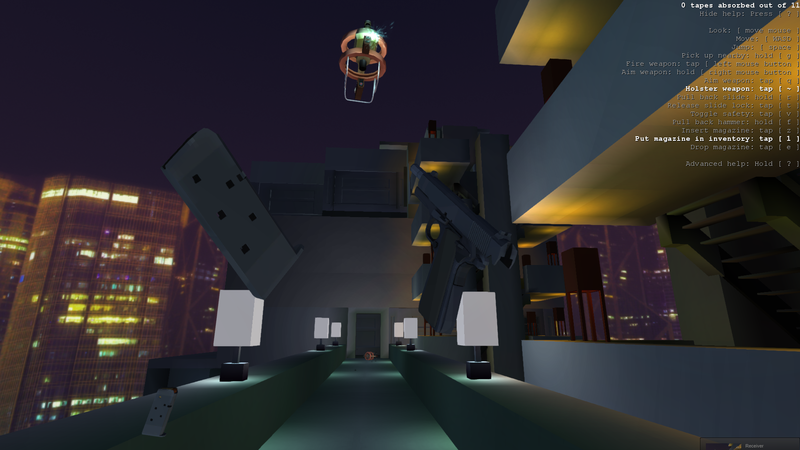 It’s more of a gun simulator that’s been wrapped into a game prototype. Every part on the game’s three firearms is simulated, and must be manipulated by individual keyboard keys. In order to prepare the M1911 for firing you have to eject the magazine, holster the weapon, slide bullets in one at a time, unholster the weapon, slide the magazine back into the gun, take the safety off, slide the top slide back, and aim the weapon. Was there a bullet already in the chamber? Well, now it’s on the floor. Learning how to reload is a chore, ammunition is sparse, navigating the rooms is uncomfortably suspenseful, and the enemies’ attacks are always lethal. Why would anyone willingly submit to such a difficult time sink? Because it’s awesome!